2-Day Private Pamukkale Tour Package from Istanbul. 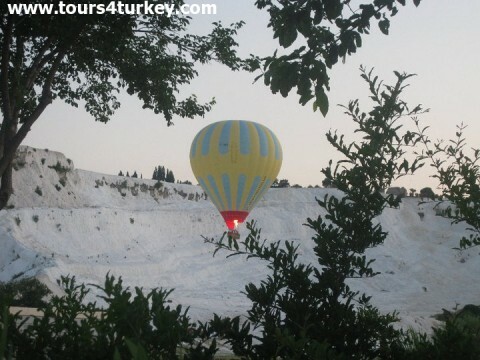 The best Pamukkale tour option from Istanbul. Pamukkale tour from Istanbul starts with a pickup from your hotel in Istanbul. Tours4Turkey staff will arrange your airport transfer for your flight to Pamukkale. On arrival in Denizli airport our team members will meet you and drive you to Pamukkale town where the tour starts. Pamukkale Naturel Lake and Park. After the guided tour of Pamukkale our guide and driver will take you to Karahayit Red Springs. Red spring water comes out at 40 degrees Celsius and it's known as one of the healthiest natural cares for human body. After the trip at Karahayit village you will be transferred to your hotel for overnight. Today after a delicious breakfast at your hotel we will pick you up for a unique Turkish Bath service. The bath comes with a massage by an expert using traditional rituals will take about 1.5 hours. After the massage you will be transferred to a local village for an ecological lunch made by villager ladies. The last part of the day is a visit to Kaklik Cave which is known as Underground Pamukkale, near Denizli airport. At the end of the tour, we will transfer you to Denizli airport for your flight to Istanbul. On arrival in Istanbul airport our team will meet you and arrange your transfer from the airport to your hotel. Pamukkale tour from Istanbul tour price , please ask our team! We will find the best flight prices and customize a great price and package accordingly.